Perennial herb from a fibrous-rooted rhizome or short, woody, stem-base; stems ascending to erect, branched above; 10-60 cm tall. Basal leaves oblanceolate to egg-shaped below, usually stalked, often soon deciduous; middle stem leaves lanceolate to egg-shaped, unstalked, and often with clasping, ear-like flanges at the base, glabrous to soft-hairy, mostly entire, 2-12 cm long, 5-40 mm wide, 3.5-7 times as long as wide; upper leaves reduced. 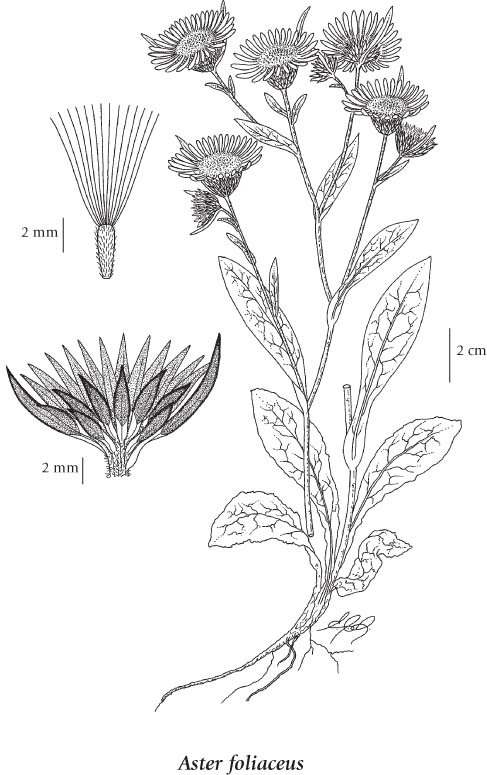 Heads with ray and disk flowers, solitary to many in a rounded inflorescence; involucres 9-12 mm tall; involucral bracts graduated, the outer large and leaflike, the inner smaller, oblong, obtuse or abruptly sharp-pointed, glabrous on the back, fringed on the margins, white-margined at the base; ray flowers 15-60, rose-purple to blue or violet, 10-20 mm long; disk flowers yellow. Achenes faintly nerved, glabrous to grey-hairy; pappus white to tawny or sometimes reddish. This is a highly variable species and has been treated in various ways by different taxonomists (Douglas 1995). It appears best, at least in our region, to separate Aster foliaceus from the closely related A. subspicatus and to submerge all of the subspecific taxa recognized within A. foliaceus by some authors into one variable species. These subspecific taxa are mainly distinguished on stem heights and involucral bract lengths, which decrease with elevation. Moist to mesic meadows, streambanks, slopes and forests in all vegetation zones; common in BC south of 56degreeN, infrequent in NW BC; N to AK, YT and NT, E to AB and S to NM, AZ and CA. Aster apricus (A. Gray) Rydb.